My dress form was a gift, ideally I needed a form smaller, as I have an extremely small back to bust ratio, but it worked, just. I had help setting mine up in the form of mum and dad. Dad was tasked in getting the height correct, involving him waving a ruler around like a sword (!!) and then mum and I measured up for the rest. After the height the first key measurement was neck to waist. There is a pin in the back of the dress form to represent my nape (as I don’t usually get to see it) and then the lower half of the form adjusted to get the waist height in the right place. 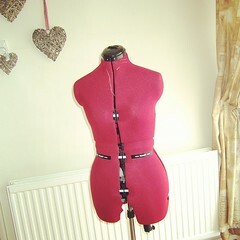 Next came the easy parts – bust, waist and hip measurements. Waist and hips were straight forward. The bust, as you will see from the picture, does not represent mine whatsoever. So the form was adjusted to fit by back size, I then placed an old-ish bra that still fits on to the form and stuffed it. There is something not-quite-right in stuffing my bra aged 35 a) for the first time and b) on a dress form… The stuffing was not a simple task due to angles. In the end I got the stepladder and stood behind the form, looking over the neck, effectively creating the same view that I would normally see them in. Once everything seemed to be set up, I slipped on a few dresses that fit me well and it's ready. Now all I need are the talking mice and a fairy godmother and we are good to go!